2 New Beautiful Bronzers from Physicians Formula. When it comes to drugstore brand bronzers, Physicians Formula is always a cut above the rest. I equate their bronzers as if they were from a luxury department store with an affordable price tag. Feast your eyes on these beauties new in the PF bronzer department this year. To choose from either of these bronzers just think what do you want from a bronzer? A shimmery bronzed look or a beautiful light bronzed glow? Or you can always pick up both to use as your mood warrants! 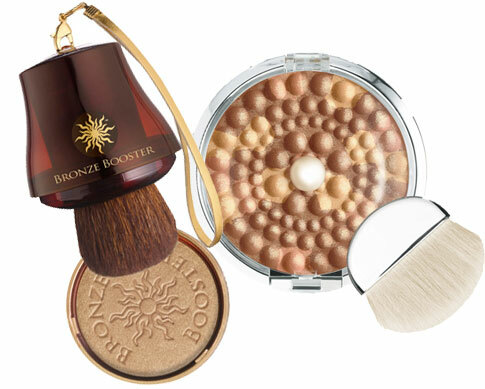 For the more bold shimmery bronze look, choose Bronze Booster Glow-Boosting Pressed Shimmer Bronzer. The formula provides a beautiful smooth bronzed glow with a bit of shimmer. The bronze color is long lasting and naturally beautiful. You can select from your skin tone (Fair to Light, Light to Medium, or Medium to Dark) to get the perfect shade. If you are going for bold, pick a shade darker. "Formulated with Glow Activators Technology to provide Triple-Action Bronze Boosting that helps enhance and extend the life of your tan glow and improve skin's clarity and radiance." For a beautiful sheer pearly bronzed glow, select Mineral Glow Pearls in Bronze Pearl. It's beauty in the palette will blow you away, but not as much as when you apply. It can be used alone for the most beautiful sheer bronzed glow or used on top of a deeper bronzer to highlight and make skin look perfect. Bronze Booster retails for $14.95 while Mineral Glow Pearls sells for $13.95. Pick up these bronzers at mass retailers now before they sell out for the season. I shop for mine locally at CVS.